Health experts advocate ‘eating the rainbow’ – but that doesn’t mean surviving solely on Skittles! Eating the rainbow means that you incorporate several different colors of fruits and vegetables into your diet. Green is easy; we can all name at least three green vegetables. But orange? Purple? Red? We’ve got those colors taken care of with the dynamic duo of sweets and beets. WebMD names sweet potatoes one of the top five winter superfoods, calling it ‘among the most nutritious foods in the vegetable kingdom.’ They’re packed with calcium, and have a high glycemic index so you’ll fill fuller, longer. 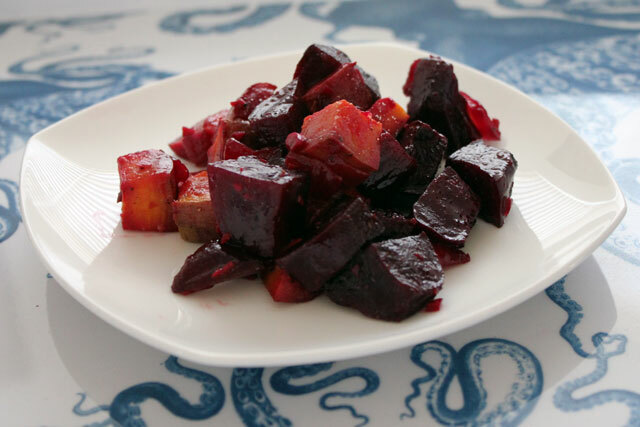 Beets are the co-star of this recipe, adding a natural sweetness to the dish as well as a heaping helping of fiber, antioxidants, and folate. 1. Preheat the oven to 400°. Peel the beets and chop them into bite-sized chunks (about an inch). Toss beet chunks with 1 tablespoon of olive oil, and arrange on a baking sheet in a single layer. (I used parchment paper for easy clean-up.) Bake in the preheated oven for 15 minutes. 2. As the beets bake, chop the onions and sweet potatoes into bite-sized pieces. Mince the garlic. Put the onions, sweet potatoes, garlic, the other 2 tablespoons of olive oil, sugar, salt, and pepper into a bowl and mix thoroughly. 3. When the beets have cooked for 15 minutes, take them out and add the potato and onion mix to the beets. Bake for another 40 minutes or until the vegetables feel tender, stirring occasionally. Enjoy!